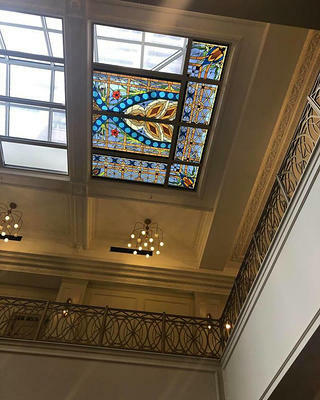 By the time Amy and Amrit Gill set about restoring the Union Trust building in downtown St. Louis, it had the usual markings of a century-old building that had sat mostly vacant for a few years. 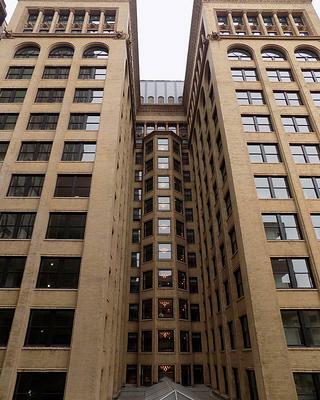 The windows needed repairs; the elevators were breaking down; parts of the terra cotta facade were deteriorating; the electrical, plumbing, and mechanical systems all needed updating. “And there was a lot of green shag carpeting,” Amy Gill says. It was nothing the Gills hadn’t seen before. The husband-and-wife team behind development firm Restoration St. Louis have restored or rehabilitated a number of old buildings around the city, and have opened hotels in historic structures in Davenport, Iowa, and Sioux City, Iowa, as well. The Louis Sullivan-designed Union Trust building, now the Hotel Saint Louis, is a St. Louis City Landmark. 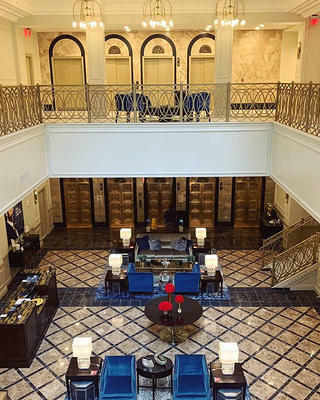 In December 2018, the Gills’ unveiled the building in its newest iteration, the Hotel Saint Louis, a 140-room hotel with 14 apartment units and a penthouse on the top three floors. It was a three-year, multi-million-dollar effort, with the Gills putting their full force into honoring Sullivan’s design. A detail on the Hotel Saint Louis' facade. Decorative terra cotta details on the building's facade. 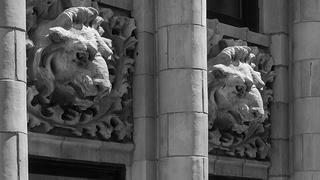 Terra cotta lions heads along the upper floors of the building's facade. 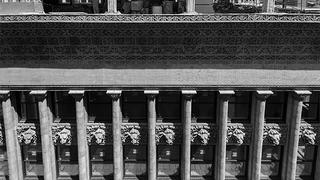 Decorative columns along the upper floors of the building's facade. The Gills brought the building’s facade back to its original state as much as possible. 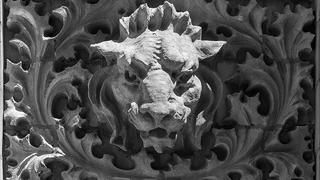 Some of its original features were lost in a 1924 alteration, including its arched entrance and 15-foot gargoyles. And large, round windows on the second floor were replaced with the square windows that are there today. 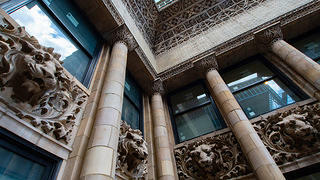 But its terra cotta trim and cornice, arched windows, upper-floor columns, and terra cotta lion heads were still intact. “[The facade] needed a lot of love, but now it’s in fantastic shape,” Amy Gill says. The two-story lobby of the Hotel Saint Louis. The Gills re-created this stained-glass ceiling. Inside the building, the Gills faced one big challenge: There were no existing photos of the interior, meaning the Gills had to do their best detective work. But once the Gills began working on the interior, they made some crucial discoveries. 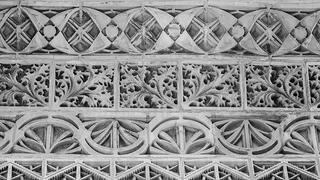 Buried underneath five layers of ceilings in the lobby was original plasterwork, which they were able to replicate. And they re-created the original stained-glass roof in the atrium, also buried under layers of plaster. The Gills retained the original stonework on the elevator landings. 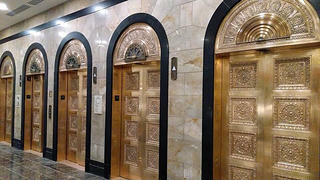 Each floor had a different type of stone, including Tennessee marble, white marble, and terrazzo. 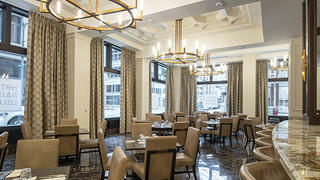 Union 30, a new restaurant in the Hotel Saint Louis. On the ground level, the Gills opened Union 30, a new restaurant offering a mix of classic dishes, traditional St. Louis fare, and comfort food. Its name references the building's original name and its city landmark number. Each elevator landing features original stonework. The hotel offers 140 guest rooms. The Gills added several St. Louis-specific touches throughout the space. They turned photographs of the building’s cornice into wallpaper, which was hung in the hotel rooms. 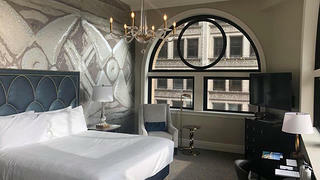 The headboards in each room have an arch design, referencing the city’s most famous landmark. And the minibars are stocked with locally-made snacks. Historic Hotels of America QUIZ: What’s the Perfect Historic Hotel for Your Next Vacation?